Thank you to Godai for sending me product. As always, all opinions are my own. Since giving birth to our daughter five years ago, I’ve been phasing out as many chemicals as possible from our home. Before having kids I honestly didn’t consider the toxic ingredients we were putting in and on our bodies, but when our daughter was born with very sensitive skin I started to realize it was an issue. I’d always thought I had asthma because when we’d clean our apartment I’d get very wheezy and have trouble breathing. It turned out I was just having a reaction to the wall plug-ins that were pumping toxic VOCs into our air. Long story short, I decided that we needed to make a conscious effort to start purchasing products that would help our bodies and not harm them. 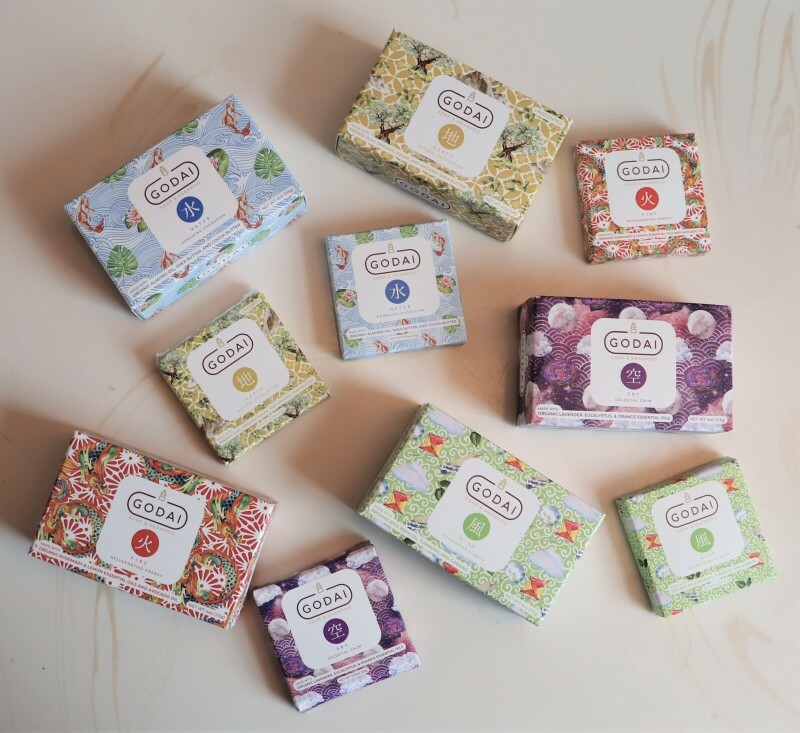 Recently I discovered Godai Soaps, which are certified organic and we’ve been using them for everything! 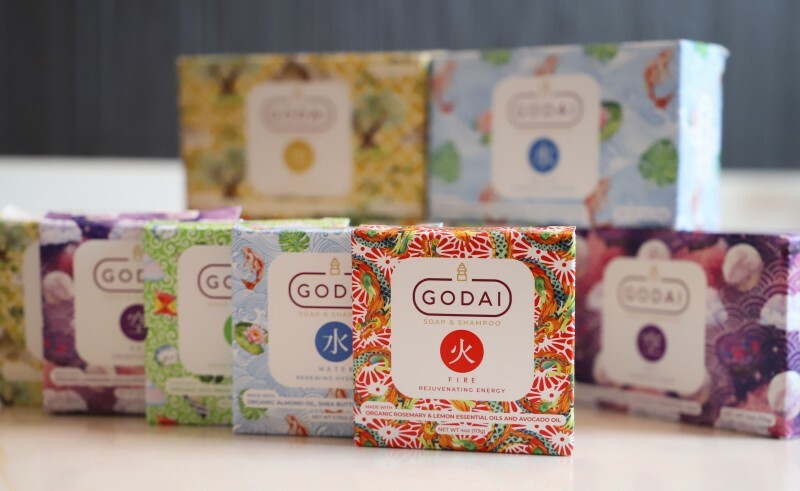 Godai Soaps were created after the Japanese terms five (go) and Great (dai), signifying the five elements. Their five soaps are based on these elements, including earth (ground), water, fire, wind, and sky (void). Made in the USA, these soaps are all certified organic, and they’re also vegan and non-GMO. 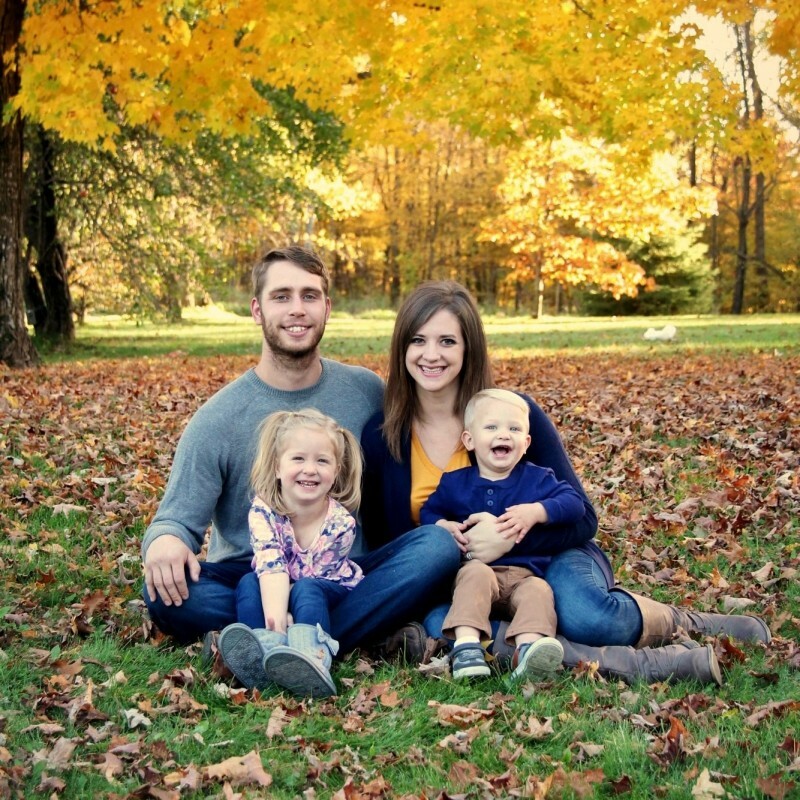 For our family with sensitive skin, this is a huge deal! All of these soaps smell amazing, though I think my very favorite is the Fire (Rejuvenating) Bar. Check out the features of each of the five available bars. This soap uses rosemary oil, lemon oil, and avocado oil to rejuvenate dry skin and hair. Living in Minnesota winter means my hair and skin are both in terrible shape. This combination is perfect and the smell is so refreshing! I’ve actually never used a shampoo bar before but I have to say, I’m sold! While it did take some getting used to, it seems to hydrate my hair very well and it leaves my hair smelling fresh, too. Rosemary oil helps to improve blood flow and brighten skin and hair, while the avocado oil helps hydrate and restore damage. The Water Bar is a mix of organic cocoa butter, shea butter, and white clay. These bases are great for dry skin and hair, so this soap has been a big hit around here as well. The scent is so mild and it has a very smooth feeling application. The white clay helps with gentle detoxification and exfoliation. The water bar can be used on the face, body, and hair. The Sky Bar helps to soothe dryness and reduce inflammation with a combination of lavender oil, eucalyptus, and orange oil. If you have damaged, inflamed, or painful skin, this would be a great option. Lavender acts as a natural toner, while soothing inflammation and promoting healing. Eucalyptus has a distinct but enjoyable scent, and while this is one of the more scented soaps, it’s very refreshing! This soap and shampoo bar is particularly good for people who are prone to acne, dandruff, or aging skin and hair. With a base of organic sunflower, coconut, palm, and safflower oils, this bar reduces inflammation and promotes glowing hydration. Rice bran oil is a natural, non-oily moisturizer, while the barley grass powder heals acne, tightens skin, and helps prevent dandruff and hair loss. It does contain turmeric oil which has a fairly distinct scent, but I tend to like it so this isn’t a problem for me! The Earth Bar is an unscented option, which is perfect for very sensitive skin, or those sensitive to smells. It offers very gentle exfoliation to clean pores get rid of dead skin. The French clay in this bar absorbs oils and toxins from your hair, and tightens pores while toning skin. It has soothing, natural oils to cleanse and refresh your face, body, and hair. The Water, Sky, and Earth bars can also be used on pets, which I think is wonderful. We have two cats and while they’re indoor cats who don’t need baths very often, when they do I like having a non-toxic option! Godai Organic Soaps are available in two different sizes, and in any various bundles online. The 4 ounce bars are perfect for home use, and we use them for washing our hands as well as in the shower for our bodies and hair. They also offer .75 ounce bars which are great for travel and smaller hands. 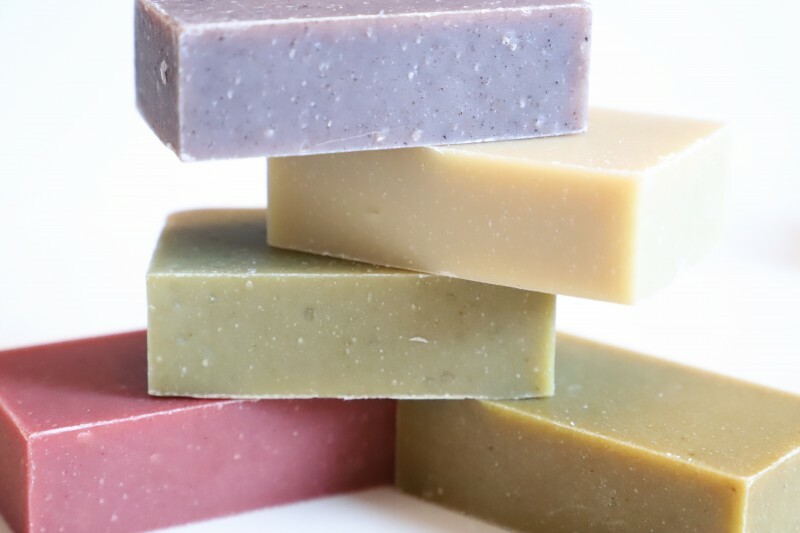 I think these soap and shampoo bars would make great gifts or stocking stuffers, too, so I’ll keep them in mind for holidays this upcoming year! Buy it: You can purchase these organic bars from Godai’s website! You can get FREE shipping on orders over $35. 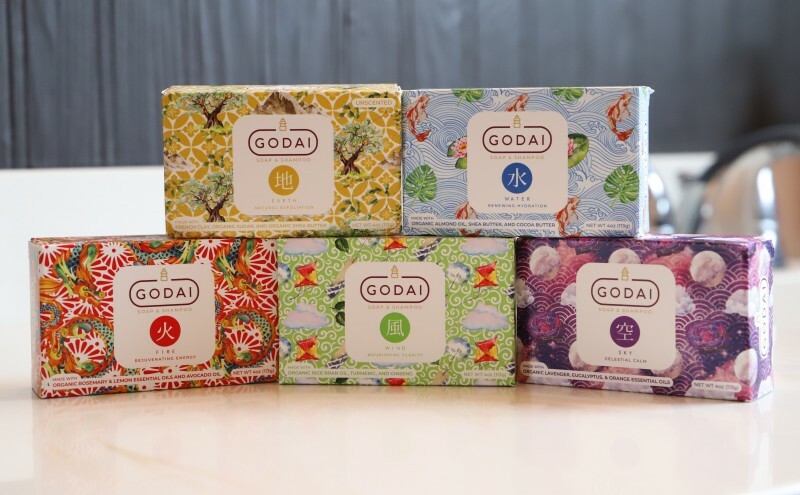 Win it: One lucky reader will take home a gift set of these Godai Organic Soaps! The winner will receive one of each of the soap/shampoo bars in the 4 ounce size. This is a US giveaway ending 2/6/2019. Good luck! I love using natural soaps like these. They look wonderful. I want to try the Fire (Rejuvenating) Bar and the Sky bar. I like all the things this soap doesn’t have in it. The water bar sounds like just what I need! My daughter has acne as well as dry skin. I think I’ll try it for her!! These soaps look great! It’s interesting that they can be used on pets. I like the fact that they are non-toxic! You have no idea how heavenly this sounds.. I need pampering! These have such beautiful packaging, and the formulas sound interesting! They must smell great! I like the 5 bar sample set. I love natural and healthy product on my skin because I have sensitive skin these soap looks really natural and smell amazing. 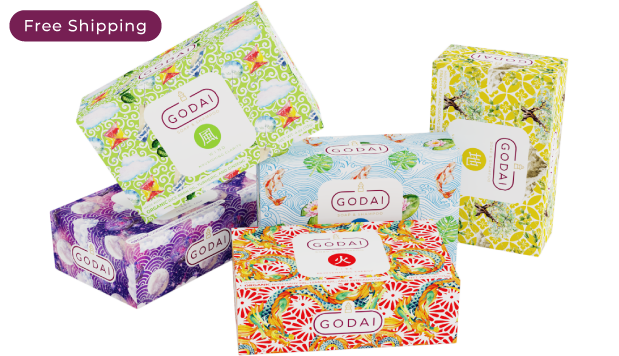 My favorite is the GODAI SOAP WATER 水 (MOISTURIZING BAR SOAP), I’d love to try it! I love natural soaps and organic products and I am always on the lookout for such items. Thank you for the review of these natural products. I love trying out new soaps. Being all natural makes it even better.